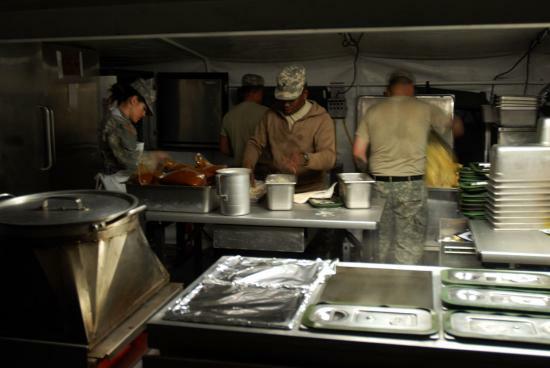 CAMP BLANDING, FLA. (March 10) -- While most of the rest of the 1st Battalion, 258th Field Artillery Regiment was fast asleep preparing for their next day on the gun line, cooks from G Company were just getting up, beginning their shift preparing meals for several hundred Soldiers. The Soldiers of “Golf” Company, part of the 427th Brigade Support Battalion and attached to the 1st of the 258th as a support unit, include cooks, mechanics, and drivers, and they work around the clock to make sure the 258th’s three batteries have everything they need -- including hot meals every day. “The first shift of cooks start at 2 a.m.,” said Sgt. Reginald Mitchell, G Company’s mess sergeant. He said the first shift, responsible for preparing breakfast for 350 people, works through 10 a.m., making eggs, hash browns, and a variety of other menu items from one of seven breakfasts in the Army’s feeding program. An afternoon shift of cooks takes over as the morning shift wraps up, preparing hot dinners and packing them on to trucks to deliver to troops camped out at distant firing points. On March 12, Soldiers in A and B Batteries were treated to steaming shrimp scampi with bowtie pasta. Harris and his team of cooks work out of a “containerized kitchen” -- a fully-functioning kitchen equipped with grills, stove elements, ovens, refrigeration, and prep space, that folds out of a trailer. “Anything you can do in any commercial kitchen, you can do here,” Harris said. 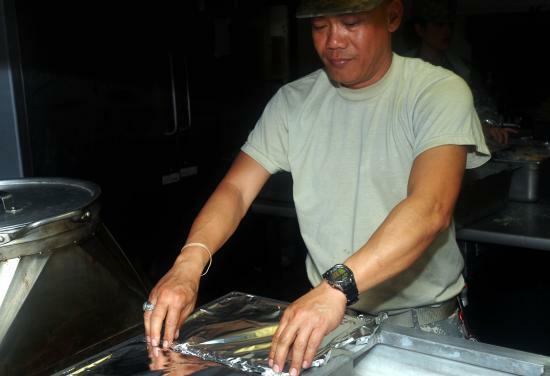 The containerized kitchen can be parked and ready to serve in 45 minutes, and Harris said it’s capable of handling about 1,000 Soldiers -- in other words, out of one trailer, he and his team can feed the entire 27th Brigade. 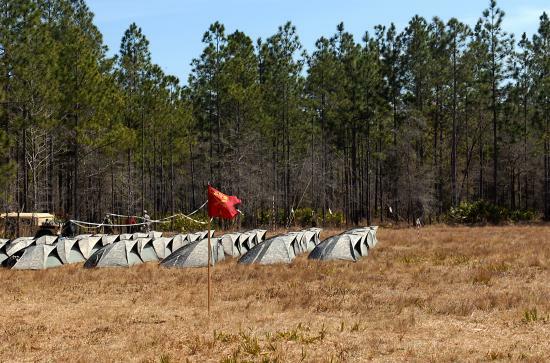 The Soldiers in the mess also ran a field sanitation unit while the 1st of the 258th conducted training exercises at Camp Blanding, Florida. To prevent that, each container used for holding and transporting food was fastidiously scoured in the sanitation tent, with wastewater carefully pumped out into a holding tank nearby. Golf Company’s cooks brought most of the food they served during the 1st of the 258th’s two-week annual training down to Florida with them, and purchased fresh produce and fruit from suppliers near Camp Blanding. Harris said they made trips every three days to their warehouse to draw enough food for three days -- which usually equated to six pallet loads per trip. He said his team provides the battalion with crucial support. Golf Company, 427th Brigade Support Battalion, will return to New York Sunday with the rest of the 1st Battalion, 258th Field Artillery Regiment. The 1st Battalion, 258th Field Artillery Regiment came “out of the field” today, returning to barracks in Camp Blanding’s cantonment area. There are many more photographs and stories to come, but for now, I’ve compiled the following. 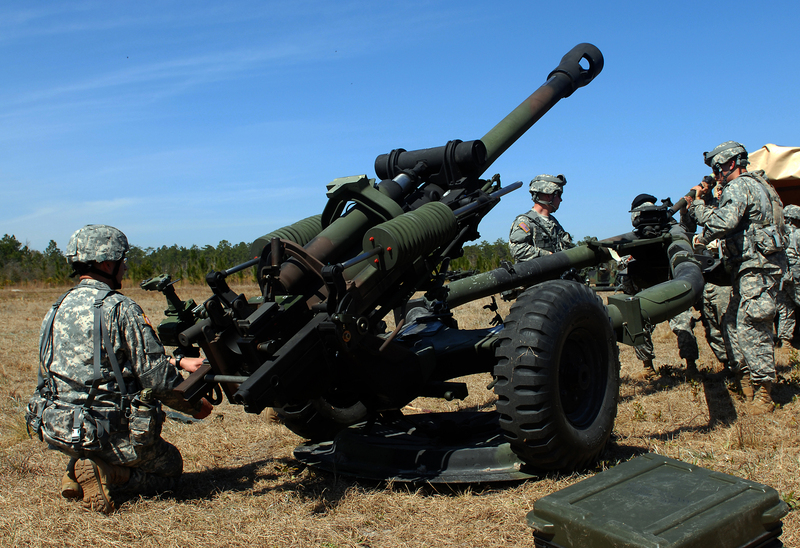 Like many combat-related professions, the artillery branch has a long and often historically-rich vocabulary of on-the-job slang and jargon. Not all of this is printable, but what follows should be enough to give the layman at least a starting point. Not slang, but rather a unit of measurement and term of art. Without getting into the geometry details, a “mil” is a bit like a degree in a circle, but much finer -- while there are 360 degrees in a circle, there are 6,400 U.S. military mils in a circle. Artillerymen use mils to precisely aim their weapons. Also, mils are not tied to any cardinal direction -- where 360 degrees is usually understood to be due north on a map, the initial direction taken up by an artillery battery is set at 3,200 mils, whichever direction that may be. Shorthand for “just a tiny bit.” While his team works to align a howitzer, a gunner will guide them saying “trails right” or “trails left”, meaning the team should move the “trails” -- the stabilizing bars behind the gun tube -- right or left, and when they get to within 10 mils of where he wants them, the gunner will often say, “right, TT... TT...”, meaning his team should just tap the trails slightly. Any Soldier who works on a gun crew. Each crew is composed of seven men: a gun chief, a gunner, an assistant gunner, an ammo team chief, a driver, the number one man, and the number two man. Each member of a gun crew has a specific role to play each time their section recieves a fire mission. 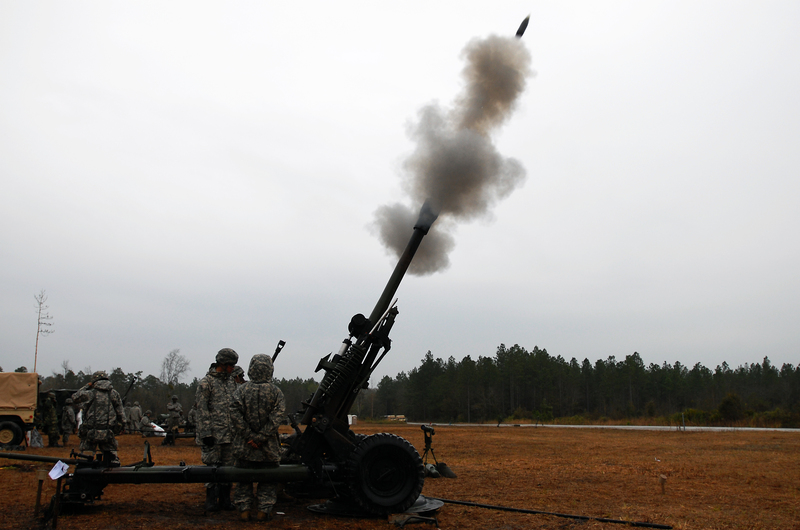 A “fire mission” is a call from higher headquarters to fire artillery on a target. Gun Chiefs are sergeants who manage gun crews. Every gunner, ammo team chief, driver, assistant gunner, and number one man and number two man answers to a gun chief. 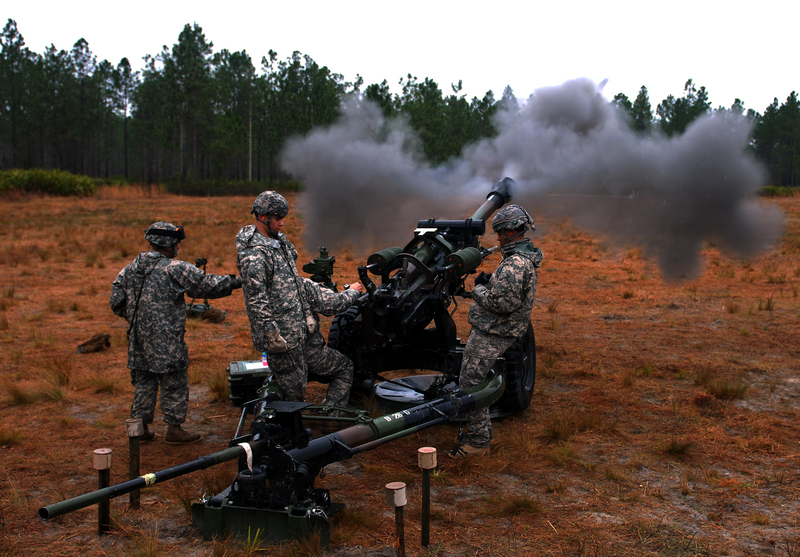 Gunnies -- short for “gunnery sergeants” -- are sergeants first class who serve as an artillery battery’s platoon sergeants. Not to be confused with the Marine Corps rank of gunnery sergeant. Once a howitzer is placed, a pit must be dug behind its position, and extra powder is stored here. Each 105-millimeter round comes with seven explosive “powder” charges, and depending on the mission, any number of these may be used. A gun crew’s “Number Two Man” takes the leftover charges and runs them back to the powder pit, usually about 50 meters behind the gun and in the direct line of sight of the gunner and gun chief. Number Two man holds the charges over his head, so the gunner and chief can look back and quickly verify that the round they are about to fire holds the correct number of powder charges. Usually called over the radio by forward observers who watch for artillery rounds impacting, “steel on steel” indicates rounds have landed directly on an enemy vehicle, weapon emplacement, or fortified position. Staff Sgt. Onix Lugo, Target Acquisition Platoon Sergeant for Headquarters and Headquarters Battery, 1st Battalion, 258th Field Artillery Regiment, holds an IV bag for a simulated casualty during his unit's mass casualty exercise at Camp Blanding, Florida, March 13. 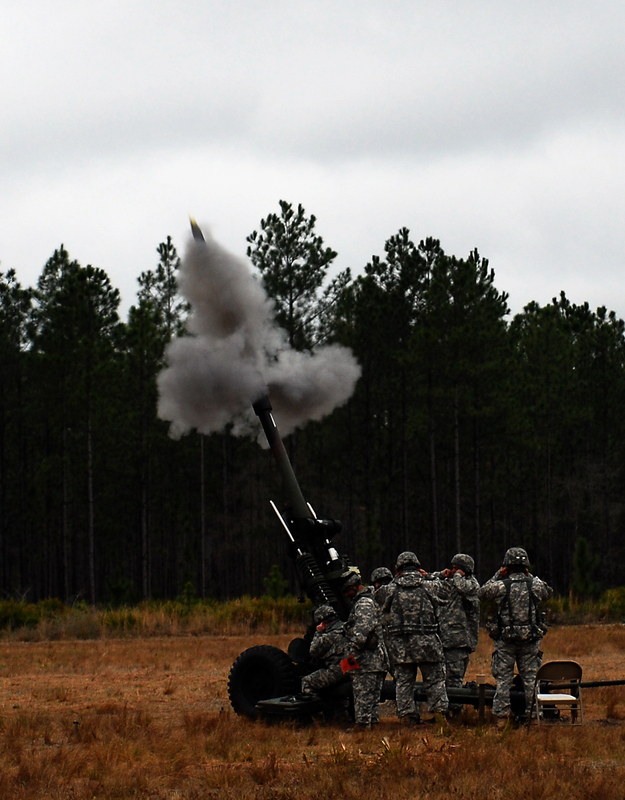 CAMP BLANDING, FLA. (March 14) -- A loud bang marked the beginning of a mass casualty exercise for the medics of Headquarters Battery, 1st Battalion, 258th Field Artillery Regiment during the unit’s annual training at Camp Blanding, Florida. As the New York Army National Guard battalion’s firing batteries conducted training and gunnery exercises on the M119A2 howitzer, the unit’s medical section ran a simulation of an enemy artillery round impacting in the headquarters battery’s operating area. 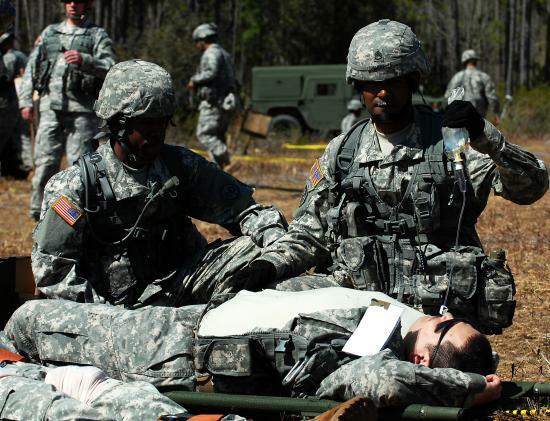 At the sound of the simulated explosion, medics raced from the battalion aid station to find and triage “casualties” -- other headquarters battery and Golf Company Soldiers who were tagged with various kinds of injuries, from minor scrapes and bruises to gunshot wounds and broken bones. “When we heard the explosion, we knew we had to respond to the scene,” said Pfc. Richard Latkovich, a Headquarters Battery combat medic from Manorville, N.Y. The battery’s seven medics worked with Soldiers trained as combat life savers, triaging the wounded and carrying severely “wounded” Soldiers to the aid station tent or to a helicopter MEDEVAC site. Latkovich said Soldiers with minor injuries received treatment and then helped with more severely-wounded patients. While the medics and combat life savers hurried from patient to patient, Soldiers from Headquarters Battery and Golf Company established a security perimeter around the area. Combat life savers and medics practiced applying bandages, carrying wounded troops, and even inserting real intravenous lines. “The medics did what they’re supposed to do, and we did it in a timely fashion,” said Capt. Earl Dawkins, a physician’s assistant from Staten Island who serves as the battalion’s PA. He said the “immediate” patients -- the ones who needed to be evacuated or treated immediately -- were taken care of within 45 minutes of the start of the exercise. Once the exercise ended, Headquarters Battery commander Capt. Kar Chu discussed the action with his Soldiers. Lt. Col. Michael Hoblin, the 1st of the 258th’s battalion commander, stressed the importance of having a well-trained team of medics and Soldiers who know how to provide first aid. Latkovich said it was all in a day’s work for the headquarters medics. “We just did what we were trained to do,” he said. CAMP BLANDING, FLA. (March 14) -- Rain pelted Soldiers of Alpha Battery as they placed their guns the morning of March 12, but despite the wet weather and low visibility, the artillerymen qualified on the M119A2 howitzer, firing 105-millimeter rounds over more than four kilometers at Camp Blanding, Florida. The Soldiers are members of the New York Army National Guard’s 1st Battalion, 258th Field Artillery Regiment, headquartered in Jamaica, N.Y. 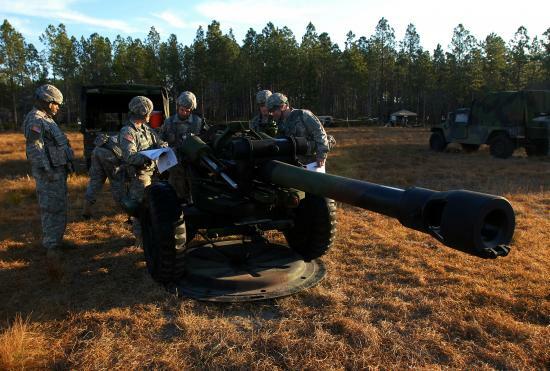 They traveled to Camp Blanding March 5 to conduct two weeks of annual training exercises, including qualifying all their artillery gun crews on the M119A2, a newer weapon that replaces the battalion’s old M102 howitzers. While the battalion also includes medics, mechanics, communications specialists, and a host of other military occupational specialties, gun crew qualification constitutes the primary mission for the unit’s annual training. Dedrick said the weather conditions in Florida -- chilly mornings leading into hot, sunny afternoons -- made for an ideal training environment for the 258th’s Soldiers. “The temperature change is a lot closer to overseas than at Fort Drum (N.Y.) or Fort Dix (N.J.),” he said. Many of the battalion’s Soldiers were using the M119A2 for the first time, and a team of artillery trainers from Fort Sill, Okla., were on site to guide the troops through each phase of gunnery preparation. Dedrick said they demanded precision from each gun team member. Each crew fired six rounds, one for each fire mission they were assigned. A fire mission begins when a forward observer, usually miles away from the firing battery, identifies a target and contacts the battery’s fire direction center. Using precise coordinates, the observer describes the type of target and where it is located. Soldiers in battery fire direction centers determine what kind of round to use on each target, and where each gun needs to point in order to hit it. This information is relayed to the crews on the gun line, who then move as quickly and precisely as possible -- always being careful to follow safety procedures -- to prepare the ammunition, load and aim their howitzers, and finally fire. “When you hear that ‘steel on steel’ come over the radio, and you know that you’ve done your job, there’s just no better feeling in the world,” said Dedrick. 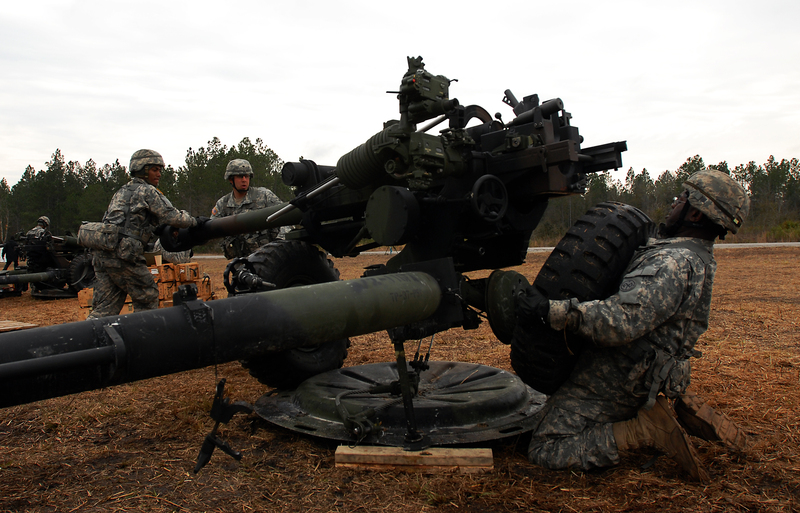 With Battery A’s gunnery complete, the battalion plans to conduct gun crew qualifications for Battery B March 17. Meanwhile, the battalion’s Soldiers will spend their time training on other necessary Soldier tasks. They will travel back to New York March 20. CAMP BLANDING, FLA. (March 10) - As the 1st Battalion, 258th Field Artillery Regiment’s Alpha Battery worked with artillery certifying teams from Fort Sill, Oklahoma, the battalion’s Bravo Battery Soldiers sharpened their warfighting skills and familiarized themselves with the M119A2 howitzer. The New York-based battalion was conducting two weeks of annual training exercises at Camp Blanding, Florida, where artillery gun crews will qualify on the new howitzer, which replaces the Vietnam War-era M102 howitzers they have used in the past. Through the first week at Camp Blanding, Bravo’s Soldiers trained on basic warrior tasks -- clearing rooms, reacting to Improvised Explosive Devices (IEDs) and detainee operations -- often learning from seasoned veterans who had put those skills to use in Iraq and Afghanistan. Staff Sgt. Jaime Betancur spent several years on active duty as an infantryman with the 101st Airborne (Air Assault) Division before joining the 258th as an artilleryman. He taught a class on reacting to enemy ambush. In another class, taught by Staff Sgt. 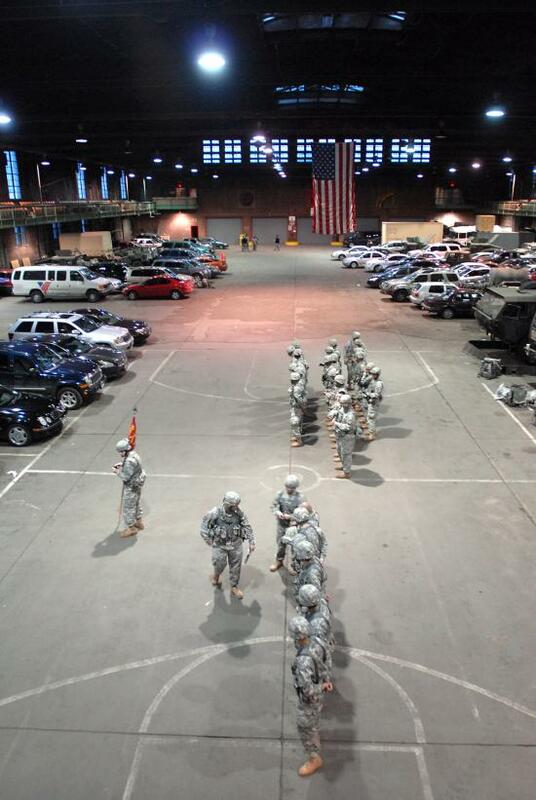 Antoine Juste, Soldiers used a “glass house” -- a building floor plan laid out in tape on the ground -- to learn tactics for entering and clearing a room, how to clear a building, and how to move down a hallway in a tactical formation. Bravo Battery Commander Capt. Marc Lindemann said his Soldiers also spent time at Camp Blanding’s Engagement Skills Trainer, a digital system that allows Soldiers to practice rifle marksmanship. Bravo’s Soldiers also got some hands-on experience with the M119A2 -- the “One-one-niner,” as artillerymen usually call it. Wednesday evening, the battery’s gun crews practiced emplacement drills, using Humvees moving in formation to tow the howitzers into designated positions, and then setting the guns into firing position. The battery has a total of eight minutes to get all eight guns set up and ready to fire -- which leads to a certain level of friendly competition between gun crews during the drills. Wednesday, the Gun Seven team edged Eight by several seconds, and as they finished, Spc. Gregory Gati, Seven’s gunner, leapt away from his sight shouting, “Zero mils, baby! Zero!” His team had finished the emplacement drill with their gun tube aimed exactly on their designated target. 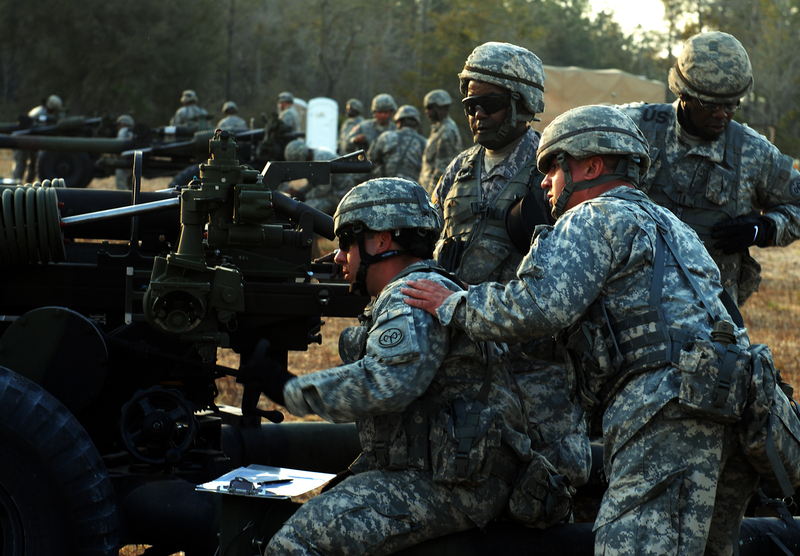 Alpha Battery will perform its live fire Friday, and Bravo is scheduled to fire March 17. CAMP BLANDING, Fla. (March 10) -- While most of the Soldiers of the 1st Battalion, 258th Field Artillery Regiment spent their day in the field, either training up on the unit’s M119A2 howitzers, preparing meals or fixing the odd vehicle malfunction, the battalion’s staff officers gathered around several tables, poring over maps and battle plans. 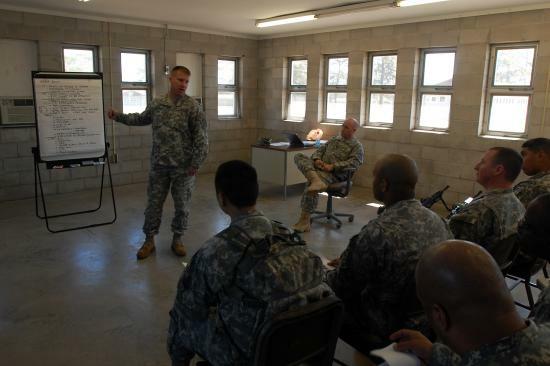 They were learning “MDMP” -- the Military Decision-Making Process -- which is shorthand for an organization and planning system meant to help leaders develop their operations plans efficiently. As is the case with many elements of field artillery, this is more complicated than it initially sounds. 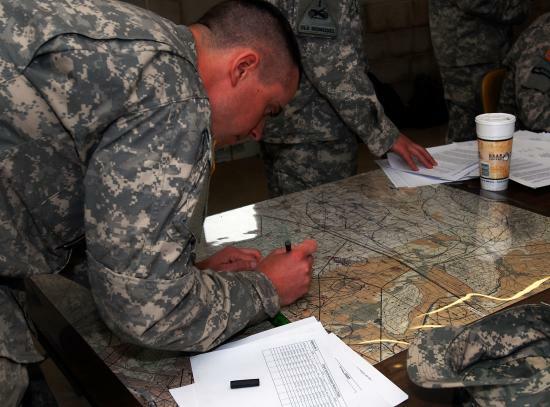 A brigade commander may want his artillery battalion to provide fire on a specific location, but in order to do that, a host of moving pieces must be carefully coordinated. The 1st of the 258’s staff is working together in a staff capacity for the first time, and Napier said he feels like they’ve learned a lot already from holding rehearsal briefings and learning from a training team from Fort Sill, Oklahoma. 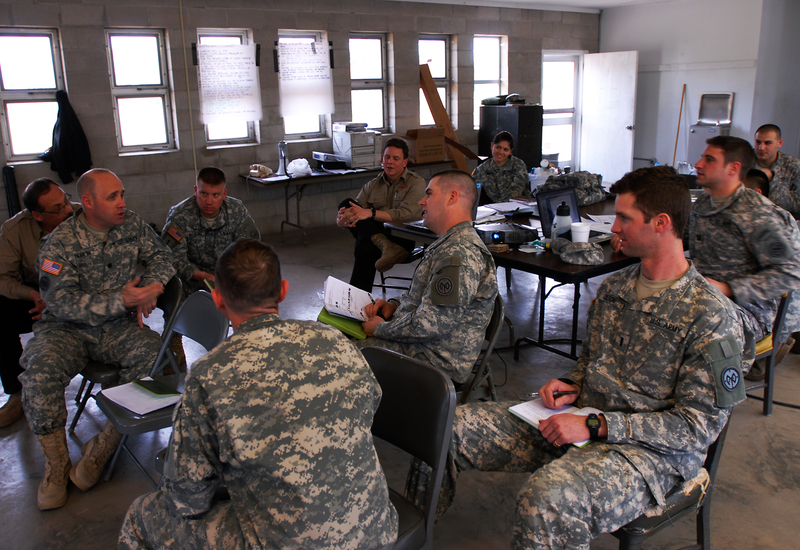 Tuesday afternoon, they held a mission analysis briefing -- one of the first steps of MDMP -- for battalion commander Lt. Col. Michael Hoblin. During the briefing, he asked pointed questions of Napier and Capt. Kar Chu, the commander of Headquarters Battery. Hoblin congratulated the staff on their improvements over the previous day’s briefing. “You guys have come a long way in just a 24-hour period,” he said. The Jamaica-based 1st Battalion, 258th Field Artillery Regiment traveled to Camp Blanding, Florida March 5 to conduct annual training exercises. During their two-week stay there, the 258’s Soldiers will qualify on the M119A2 howitzer, several crew-served weapons systems, and learn from a team of artillery trainers from Fort Sill. Pfc. 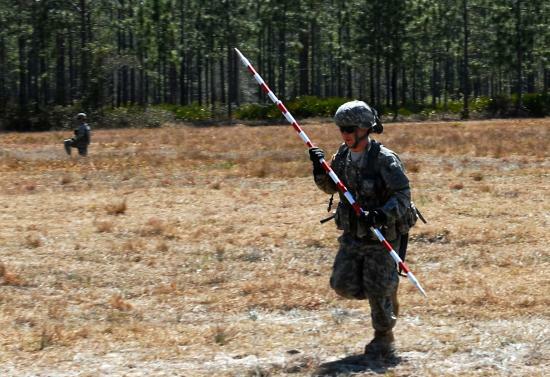 Ralph Jansen, an artilleryman with Battery A, 1st Battalion, 258th Field Artillery Regiment, runs to place reference poles behind his battery's firing line on Camp Blanding, Fla., March 8. The poles serve as guides to help the battery's fire control team align its M119A2 howitzers. Jansen is a native of Newburgh, N.Y. 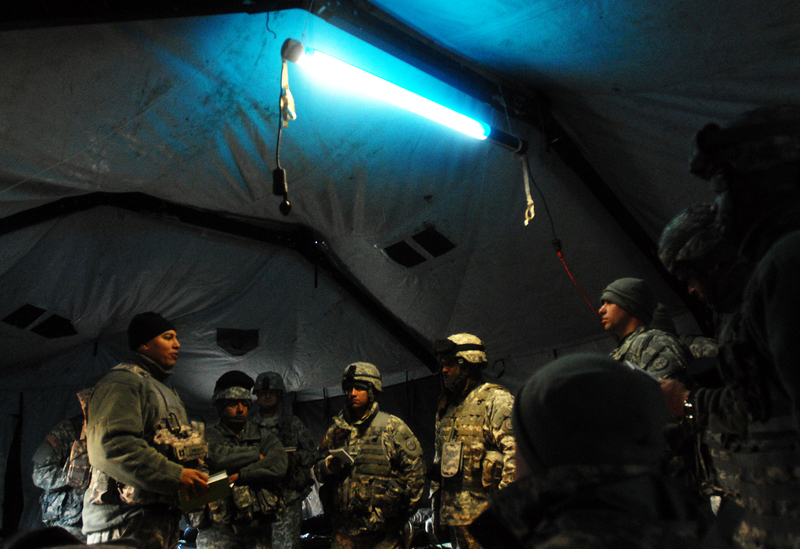 Soldiers of Alpha Battery, 1st Battalion, 258th Field Artillery Regiment woke up in their pup tents this morning, shaking off the early 30-degree chill. While their gunnery live fire is still days away, the Soldiers had plenty to keep busy in the interim. The entire battalion had been in action from the time the buses carrying its troops arrived at Camp Blanding, Fla., on Saturday morning. Vehicles were lined up for inspection before the two firing batteries and a headquarters battery for the 258th and their support unit, Golf Company (part of the 427th Brigade Support Battalion), headed into the field Sunday. 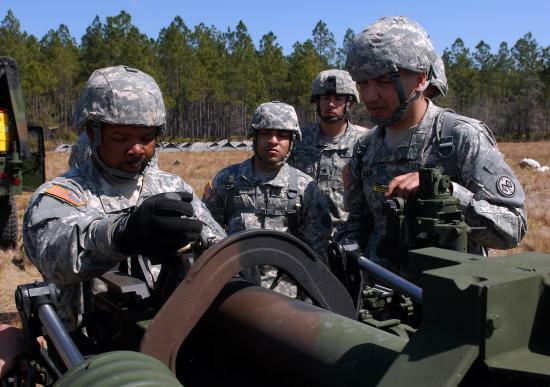 Alpha Battery’s Soldiers spent Monday refreshing themselves on the intricacies of the 105-millimeter M119A2 howitzer. For some of the newer members of the unit, the M119 was a new weapons system; a change from the smaller, Vietnam War-era M102 howitzers they were accustomed to. For the uninitiated, a howitzer is the modern version of the classical cannon, and requires a crew of seven to operate and fire. Each crew position on an M119 has a unique set of responsibilities, which crew members repeatedly train in order to perform as fast and accurately as possible. “There’s a lot of young Soldiers here, and they’re motivated,” said Alpha Company 1st Sgt. John Rembert. Soldiers on the firing line confirmed his observation. “I just can’t wait to shoot,” said Spc. Latrell Sellers, as his crew finished reassembling their gun’s breech. 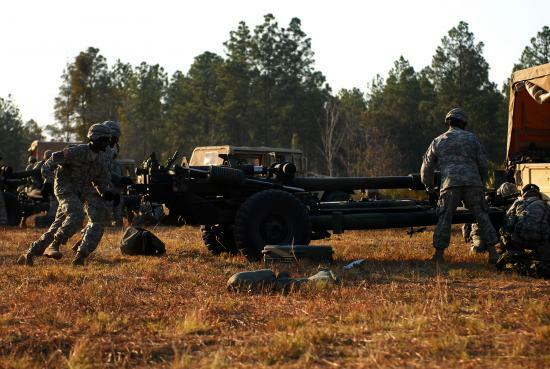 Alpha Battery plans to conduct a live fire Friday, when their gun crews will certify on the M119A2. Between now and then, a team of trainers from Fort Sill, Okla., will help guide the teams through each step of the M119’s operation. But in order to fire, gun lines need to know where to aim, which is the responsibility of each battery’s Fire Direction Center. 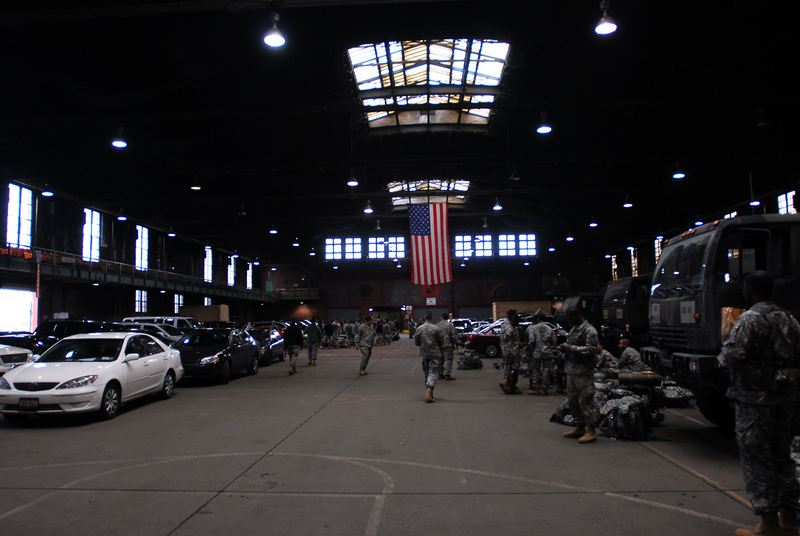 “Each piece is integral,” said 1st Lt. Nicholas Tommaso, Alpha Battery’s fire direction officer. Tommaso explained that when an artillery battery receives a mission, his team’s job is to determine exactly where and how to aim each individual cannon, as well as to determine the type of ammunition to use in each shot. It’s a complicated process -- wind speed, relative target altitude, and distance each have an effect on the way an artillery round will travel, and depending on the type of target, different rounds and fuses must be selected. While the team has a computer to make calculations quickly, Tommaso’s FDC team also does the complex mathematics by hand -- twice, for an extra fail-safe -- using charts and slide rules to determine each gun’s aiming point. “If the computer turned off, which is always a possibility, we can always run the numbers chart-to-chart,” Tommaso said. Both Alpha and Bravo batteries will take turns at the gun crew qualification range, known to artillery crews as Table VIII. Meanwhile, Headquarters Battery and Golf Company maintain a steady pace making sure meals are served, vehicles are maintained and repaired, and that basic Soldier needs stay met. The battalion Tactical Operations Center is undergoing MDMP (Military Decision Making Process) training with the Sill team while the TOC practices information management. The First of the 258th will train at Camp Blanding for two weeks before returning home to New York March 20. Soldiers from "Alpha" Battery, 1st Battalion, 258th Field Artillery Regiment set up a tent city at one of the firing points on Camp Blanding as part of their preparation to qualify gun crews on the M119A2 howitzer during annual training March 7. New York Army National Guard Maj. Peter Mehling, the 1st Battalion, 258th Field Artillery Regiment's executive officer, briefs unit leaders on their mission for annual training at Camp Blanding, Florida, March 6, as Lt. Col. Michael Hoblin, the battalion commander looks on. Photo by Spc. Ian Boudreau, 27th Infantry Brigade Combat Team Public Affairs. 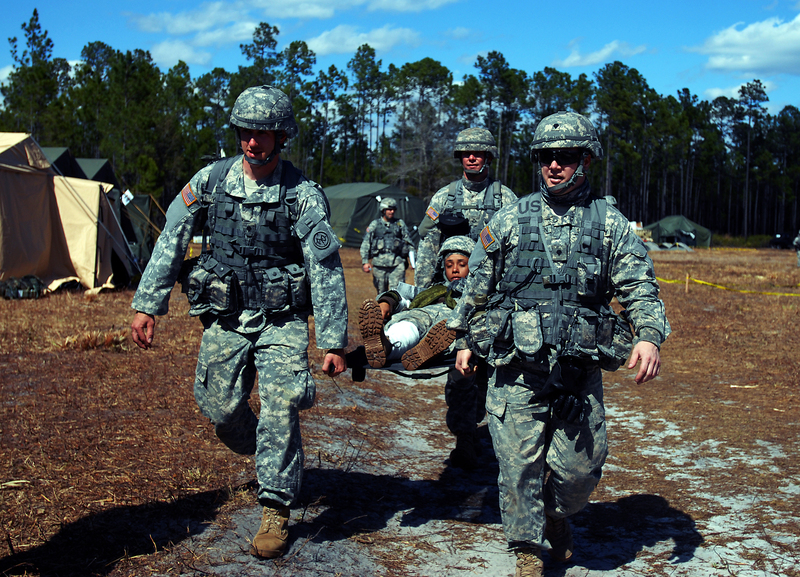 Soldiers from the 258th Field Artillery are boots-on-the-ground at Camp Blanding, Florida for annual training. 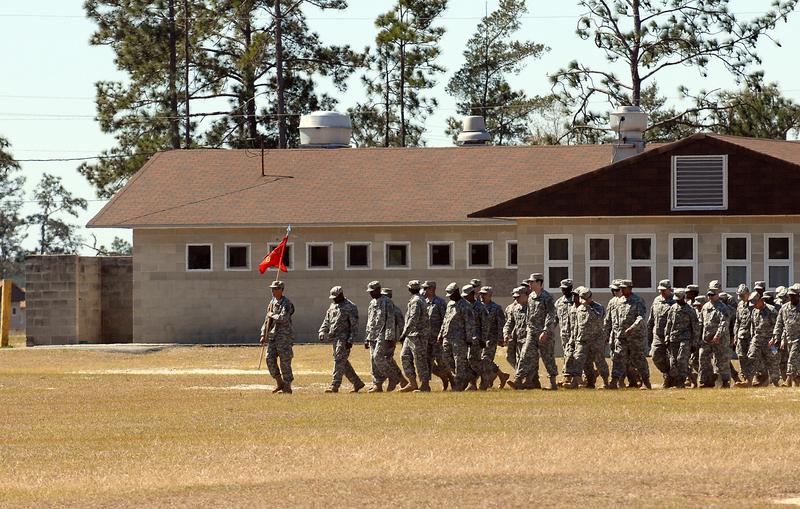 Soldiers of Headquarters Battery, 1st Battalion, 258th Field Artillery Regiment, march toward their annual training barracks on Camp Blanding, Florida, March 6. Photo by Spc. Ian Boudreau, 27th Infantry Brigade Combat Team Public Affairs. Soldiers from the 1st Battalion, 258th Field Artillery Regiment made last-minute checks to their equipment before boarding buses in Jamaica, N.Y. The battalion traveled to Camp Blanding, near Jacksonville, Fla. for annual training on M119 105 millimeter howitzers. Photo by Spc. Ian Boudreau, 27th Infantry Brigade Combat Team Public Affairs. Leaders of Headquarters Battery, 1st Battalion, 258th Field Artillery, performed last-minute uniform inspections of their troops as the unit prepared to depart from its home base in Jamaica, N.Y. March 5. The unit was heading to Camp Blanding, near Jacksonville, Fla. for two weeks of annual training. The M119 howitzer. Soldiers from the 258th Field Artillery will train on the weapon system during Annual Training at Camp Blanding Florida this month. Courtesy image. 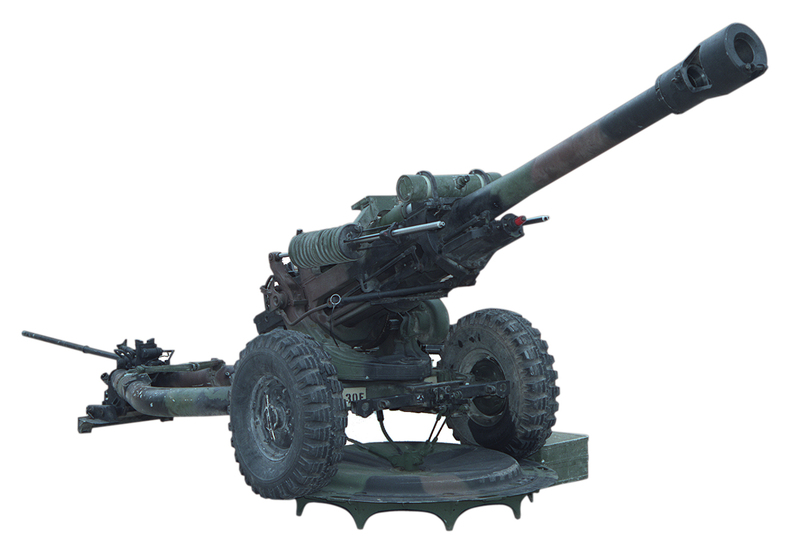 The M119 Howitzer is a lightweight 105mm towed weapon that is used to provide destructive, suppressive and protective indirect and direct field artillery fires in support of combined arms operations.